Must have been a cold day when this man brought home his brand new 1913 Model T Touring. Ford completely redesigned the body and fenders for the 1913 model year, and changed nearly every other part of the car as well. Let’s look at the very interesting 1913 model year in this edition of Model T Ford Fix. Ford records also claim that one coupe was built in 1913, probably for a Ford executive since it was not a cataloged offering. The delivery bodies were left over from 1912, the result of ordering more bodies than the market could bear. Ford produced nearly 127,000 tourings during the 1913 model year. This one has electrified headlamps and an accessory spare tire mount on the running board. Notice the hubcaps in 1913 have a black background, typical of all Ford hubcaps from mid 1911 until 1920. New for 1913 was the “Made in USA” and maker’s cartouche in the hubcap below the “high F” Ford script. A 1913 Ford catalogue shows the proper location of the carbide generator just forward of the “Ford” script on the running board. Carbide generators used by Ford in 1913 were made by either Corcoran (shown above) or JNO Brown. The instruction sheet for carbide lamp operation seems to be quite complex. In reality the lamps were easy to use and quite bright. Another brand of spare tire carrier. You needed to carry two spare tires on USA built Model T’s since the front tire size was 30 X3 and the rear tires were 30 X 3 1/2. This owner also has purchased the optional Prestolite carbide generator. This was a factory option from 1909 – 1914. Normally it would be mounted above the running board, not underneath. This fellow is pointing at another very popular factory option on all years of Model T. “Weed” brand tire chains were kept under the back seat in dry weather. You would install them if rain or snow was coming. Very few roads were paved in 1913. The Lincoln Highway was the first marked transcontinental route across the United States. In Laramie Wyoming on September 27, 1913 it was cause for celebration, but the streets were still paved with dirt. At the left side of the picture sits a 1911 – 1912 Model T Ford touring. This wonderful photo shows a very early 1913 touring equipped with an impressive aftermarket electric headlamp and cowl lamp system. We know it is an earlier car because it has pin striping on the body (and probably the wheels). Ford eliminated pin striping at the factory in 1913 model year. Dealers may have added pin striping if the customer wanted it. Also notice the windshield hinge screws are brass plated. A cartoon illustration in the San Francisco Examiner on October 31, 1913 shows more horse drawn vehicles on the Lincoln Highway than cars. The open door on this 1913 touring highlights the unique body that Ford used for this single model year. Door skins extended all the way down to the splash apron, which gave a clean outer appearance but hurt the structural integrity of the touring bodies in particular. A look at the inside of the 1913 touring door shows the complex tapered shape of the inner wooden door frame. In 1912 New Mexico and Arizona became states, and this family is celebrating the Fourth of July with their new 48 star flags and a nice new 1913 touring. This car has an accessory bumper. Notice the shape of the rear door which, like the front door, extends all the way to the bottom of the body. By the middle of the 1913 model year touring bodies began to fall apart in the center of the rear doors. The body sills were too weak to support the rear half of the body. To try and avert a public relations disaster Ford issued a free of charge “fix”, the largest factory recall since automobiles had been built. More than a hundred thousand kits were sent to Ford dealers over the next few years to beef up the defective 1913 bodies. This photo shows the factory recall brackets installed in a 1913 touring. Three carriage bolts on each side go through the door sills and extend through holes drilled through the car’s frame. The 1913 touring above has somehow lost its windshield. It has “billed” front fenders that were either from 1912 or 1915 model year. The picture shows how close the horn is mounted to the hood, necessary so that the horn tube can enter the passenger compartment. Shhhh he’s sleeping. The starting crank used for the entire 1913 model year had a black painted aluminum handle, first used in January 1912. This touring has a rear view mirror, a popular accessory. Four pretty girls would surely be able to find a young man to pull their crank. Top bows for the 1913 touring were very different from the top bows used in 1912. The new top bow design stows below the top of the rear seat, giving improved rearward visibility for the driver compared to the earlier Model T’s. Bodies in 1913 were about two inches narrower than 1912 bodies. The top bows were narrower as a result of this “downsizing” of the entire body. Many states did not have license plate laws in 1913, and Ford did not provide any mounting provisions for them either. Owners often secured plates to the firewall with screws, or to the headlight with baling wire. Not many advertisements were made by the Ford Motor Company in 1913. The advertisement above was made by a local dealer, mostly to provide the address where you could buy a new Ford. Everyone was aware in 1913 of the features, quality, performance and price of a Model T.
The “Winged Pyramid” logo was a symbol used at Ford dealerships across the world in 1913. The Ford dealer in the upstate New York city of Adams had a large building for sales, service, and storage of new Model T’s. Horses were still a more common form of transportation in 1913. The Model T continued to be the best selling car in the world, but it would be many years before the automobile replaced “Old Dobbin”. According to the Census of Agiculture, United States Census of 1910, a “Farm Horse” average cost was $105.05. Meanwhile in the same census a thoroughbred foal averaged $500. So the advertisement may be exaggerating the truth since a Model T runabout sold new for $525. Ford sold over 33,000 runabouts in the 1913 model year. A shiny new 1913 runabout. Notice the speedometer cable hangs quite low and has no support between the body and the right front wheel. Stewart & Clark supplied all speedometers and drive setups for the 1913 Fords. The cast iron road gear attached to the front wheel with four round head wood screws and tube brass spacers. The cable housings were black painted steel. The photo above shows the proper original Stewart speedometer drive with a reproduction brass cable housing. Horns in 1913 were of the single twist variety first used in 1912 beginning about June on the late 1912 model year cars. It was painted black originally except for the screen and screen door. Horns were supplied by several companies including Standard Thermometer, Rubes, and Nonpariel. Another 1913 runabout, this time with the turtle deck removed. Notice the hand crank is bare aluminum. Headlamps are aftermarket accessories, note there is a battery box on the running board. Smoke ’em if you got ’em. Front fenders came from more than one supplier. Some are flared out more than others at the front, others appear to be rolled in. This runabout has the optional Prestolite tank on the running board and the license number has been artfully painted on the radiator. This enterprising fellow has substantially increased the capacity of his turtle deck. This car has E&J cowl lamps and headlamps, all brass parts have been painted black. Another ’13 runabout with JNO Brown cowl lamps and headlamps. The headlamps have been converted to electric power which was very common even when the cars were new. A pair of JNO Brown # 16 headlamps, the most common type used on the 1913 – 1914 Fords. A well worn 1913 runabout still giving good service to its owner photographed in the late 1920’s. Ford moved assembly operations to the new Highland Park plant in 1910, but the plant was not yet fully operational. The picture above was taken at Highland Park early in the 1913 model year. Cars were being assembled at stations, just as they had been building Model T’s at the Piquette Plant in 1909. All 1913 Model T Fords were assembled this way. It would not be until well into the 1914 model year that the moving assembly line became operational at Highland Park. The design and idea for the assembly line were well established as early as 1908 while planning was underway for the new assembly plant. Ford did not yet have operational “run in” stations in 1913. Chassis were assembled, then the bare chassis were “run in” by driving them around the outside of the plant a few times, as had been done at Piquette with the earliest Model T’s. A brand new 1913 touring is ready to be shipped to its new owner. Cars were shipped in every conceivable way, from trains to ferries to ships. The turtle deck used in 1913 was unique to that model year. Corners of the trunk were quite sharp. This car was recently for sale on the internet and is quite a good restoration. 1913 was the final model year for leather upholstery in all Model T’s. This car is equipped with a Stewart Model 100 speedometer. The speedometer cable would have originally been black painted steel. A steel plate on top of the door finishes out the upholstery and was unique to 1913. Most 1913 Model T’s had wooden coil boxes. This car is equipped with a KW coil unit. Other Model T’s in 1913 might have had Heinze or Kingston coil boxes for the majority of the model year. This car has the proper 1912 – 1913 stamped brass bracket for the mixture knob. It is properly finished in black enamel as it would have been when new. Pedal pads are an owner’s addition. Late in the 1913 model year, perhaps June of 1913, Ford standardized all coil units. From this time until the end of Model T production all cars used KW designed or built coils and a standard metal coil box. The switch seen here was used, with modifications, through 1918. Meanwhile our friends north of the border in Canada had switch plates embossed with “Ford Motor Company of Canada Limited” and used the same coil box and switch design. 1913 marked the introduction of stamping “Made in USA” or “Made in Canada” below the Ford script on many parts of the car. Locations included the radiator, running boards, oil cap, and ignition switch plate. Radiators were being manufactured in both the Highland Park Dearborn Michigan USA plant and in the Ford, Ontario Canada. Radiators received their own serial number found on a plate affixed to the rear side of the upper tank. The 1913 radiator caps were modified from the 1912 version. Now the upper flute was quite rounded and shorter than the previous year. This would be the final year for the cast brass radiator cap at Ford. The radiator neck was both soldered and riveted to the upper tank. This one shows signs of someone trying to fix an annoying leak without care for the appearance of the result. 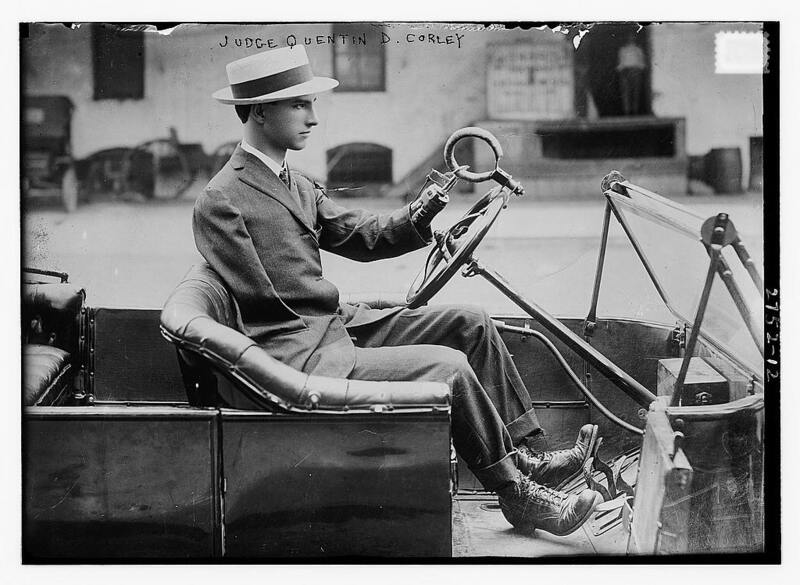 This is Judge Quentin Corley driving his 1913 Model T Ford in Dallas Texas. Mr. Corley lost both hands and one arm in a horrible railroad accident in 1905 when he was 21 years old. He invented and patented the artificial limb that he wears in this photo. Judge Corley was a respected man in Dallas until he passed away in 1980 at the age of 96. A high resolution image of this photo can be seen in the Library of Congress. Below the front seat of every 1913 Model T a body serial number was stamped into the wood. This body, made by Hayes, was stamped H3968. The steel under seat panel had no maker’s initial, that feature began in 1914. Bodies were supplied by several makers including OJ Beaudette, Hayes, Fisher, Wilson, and others. The Highland Park plant would eventually build bodies for Model T’s, but that would be in the future. A well worn Canadian built 1913 runabout has RH drive. Canadian Model T bodies were made with both front doors being operational. Cars were built with either RH or LH drive depending on local customs and laws were the car was intended to be used. Lamps on the 1913 Canadian Model T were supplied by CLAS Co, a Canadian supplier that made copies of the E&J lamps used on USA built cars. The top and fount of the lamps were polished brass. A CLAS Co tail lamp from 1913 – 14. In 1913 Francis Birtles drove his Model T touring across Australia, an adventure he would revisit several times in succeeding years using cars or even bicycles, often accompanied by one of his dogs. Birtles’ car is typical of the RH Drive Canadian built 1913 – 14 Model T with the horn mounted upside down from its orientation on a LH drive vehicle in order that the tube enter the passenger compartment while still being able to open the hood. Canadian Model T’s had the horn bulb mounted to the steering column since both doors were operable. Tarrant Motor and Engineering Company in Melbourne sponsored Birtles’ exploits. This appears to be a photo taken at the end of the journey as the car looks quite beaten. The engine used in the 1913 Model T was slightly updated from 1912. New was “Made in USA” cast on top of the cylinder head and on the side of the engine block. The aluminum intake manifold used in 1912 was continued through about May 1913. Carburetors were either the Holley Model “S” or the Kingston Model Y. This car is missing the “splash shields” for the engine compartment which in fact are a cooling aid. The wooden hood clash strips were originally painted black. A carburetor heat tube was supplied with every Model T Ford. The owners manual instructed the operator to remove the heat tube during warm weather for best performance. For 1913 the heat tube was a stamped steel part. The manifold clamp at #4 exhaust port secured the tube to the engine. Because of its position the heat tube draws hot air into the carburetor, warming it during winter weather to improve atomization of the gasoline / air mixture. Oil caps used in 1913 were similar to 1912 except that now the words “Made in USA” are engraved in the caps. The 1913 Holley Model “S” carburetor, sometimes called the Holley two screw. It is unique among Model T carburetors in having a vertical choke shaft. The design was only used for the 1913 Model T.
Ford always had a second supplier for carburetors. In 1913 it was Kingston supplying the Model Y carburetor, also known as the Kingston four ball. Like the Holley it was made mostly of cast bronze and brass components. Top view of the Kingston Model Y shows the throttle arm used on British and Canada built 1913 Fords. Drawing property of Benson Ford archive, used under my license. Due to import duties Ford Model T’s for the British market used chassis built in the USA but had unique bodies, fenders, windshields, horns and lamps of their own. Another British 1913 touring, with a totally different type of horn, lamp, and carbide generator. Yet another 1913 British touring and yet another type of lamps. World War I was just about a year away, most of the men in this photo would be dead by 1918 as the conflict decimated the majority of all men across England and Europe. Closed cars were being offered by many automakers. For 1913 the only offering available from Ford as a closed car was the town car body style. Most were used as taxi cabs or by hotels in big cities. Ford built 1415 town cars in 1913. Photos of them, like the cars, are quite rare. This 1913 town car has a popular accessory tire carrier that incorporated a storage compartment in the center of the tire rack. Several operators used Model T Town cars to ferry tourists from the hotels in Cairo, Egypt to the great pyramids. This one happens to be a 1913 as seen in the Fordowner and Dealer magazine. Steering columns evolved over the 1913 model year. The column on the right was used in the latter part of 1912 and most of 1913 model year. It featured a cast iron lower column bracket. By June 1913 the stamped steel version (left) was incorporated. This created changes in the manufacture of the dash board due to the revised mounting bolt hole pattern. The “1913” rear axle had been introduced as early as May 1912. It was used for the entire 1913 model year. While it was sturdy and reliable, the 12 rivets on each axle tube would loosen over time causing nuisance leakage. The aluminum hogshead and trapezoidal transmission door with Ford script were used again along with the lettered pedals. Pedals were marked with the maker’s cartouche, usually “DB” for Dodge Brothers. Like the pedals, most front axles, steering wheel spiders, steering arms and front wheel spindles were supplied by the Dodge Brothers and marked with the familiar “DB” cartouche. The Model T was the best selling car across the world in 1913. Here we see a delivery of new 1913 Fords in Lisboa, Portugal. English speakers have bastardized the pronunciation and spelling for centuries as “Lisbon”.